The Red Hat Enterprise Virtualization Manager can notify designated users via email when specific events occur in the environment that the Red Hat Enterprise Virtualization Manager manages. To use this functionality, you must set up a mail transfer agent to deliver messages. Only email notifications can be configured through the Administration Portal. SNMP traps must be configured on the Manager machine. Ensure you have set up the mail transfer agent with the appropriate variables. Use the Users resource tab, tree mode, or the search function to find and select the user to which event notifications will be sent. Click the Event Notifier tab in the details pane to list the events for which the user will be notified. This list is blank if you have not configured any event notifications for that user. 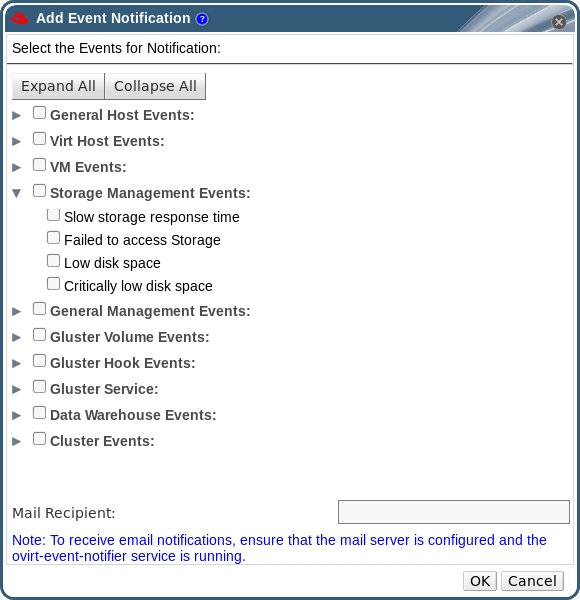 The specified user now receives emails based on events in the Red Hat Enterprise Virtualization environment. The selected events display on the Event Notifier tab for that user.